This is a delicious, luscious, creamy, sweet recipe. 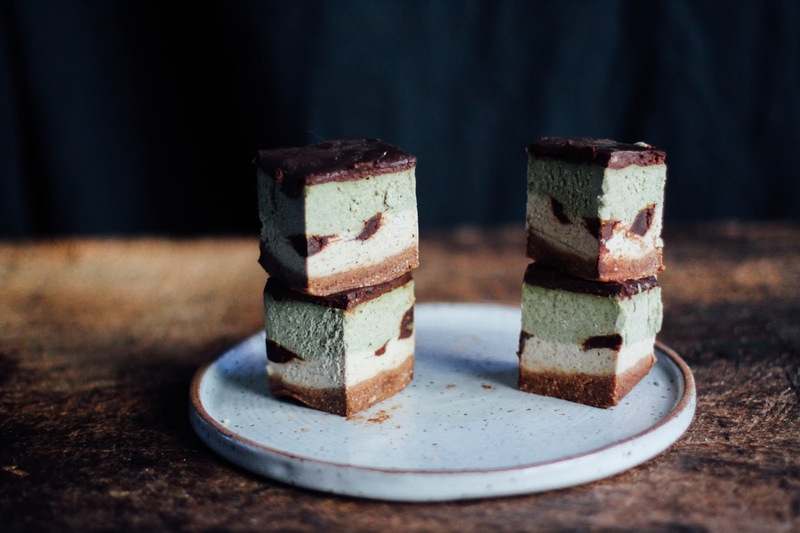 It has a subtle mint flavour, is made up of mostly vanilla cashew cream, and topped with a layer of fudge. Basically: heaven in your mouth. All the ingredients have health benefits but there's one in particular that is exceptionally nutritious: chlorella! It's dried green algae. Sounds gross and weird, yes. But once you get to know it, ya might love it like I do. Chlorella has a whack load of B vitamins, iron, protein. I try to consume it every few days and think of it as a supplement. My fave brand is Sun Chlorella. Their product is the most nutritious I have come across, it is highly digestible because of their processing method, and I dig their packaging (reminds me of 90's athletic clothing logos, which is all I look for in the thrift store). Sun Chlorella Pure Powder gives you - in one teaspoon - 88% of your DV for vitamin A, 29% of your iron, 53% of your B12, and 700% for vitamin D. Yes, seven hundred perceeeeeent. This is why I love it so. We don't get a lotta sun here on the west coast; just rain. So giving my body all the vitamin D it needs has to involve something other than sunshine. Thanks to the power of plants, I can get more than enough by taking chlorella every few days. Vegans also sometimes to tend be lower in B12 levels than non-vegans, so making sure you get enough of that regularly is important for your brain health. 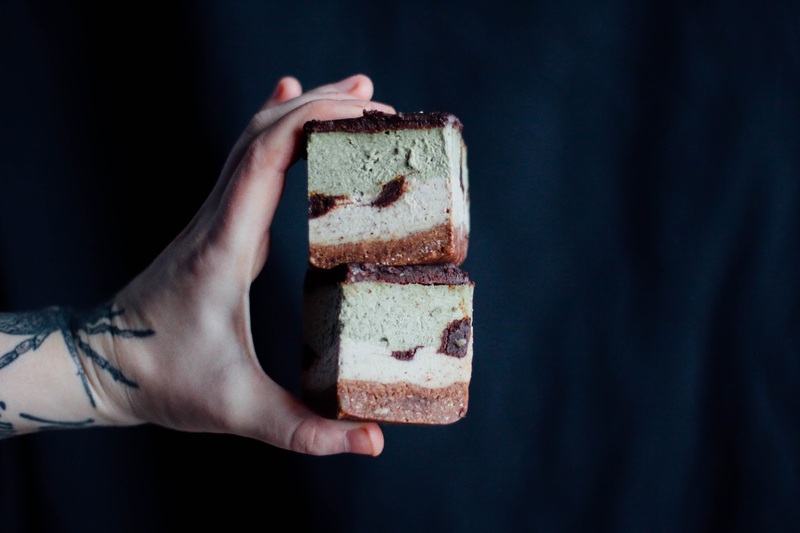 Note: the product I link to in this post will last you a year, but in my experience, it could last two or three years because I take chlorella every 2-3 days, not everyday. I know it's a bit pricey so I just wanted to make it clear that it will last you ages. This post was sponsored by Sun Chlorella but all opinions are my own. To make the base: process the oats into flour in a food processor or blender, then add the rest of the ingredients and process until a thick, moist dough forms. It should hold its shape when pressed between two fingers. If it's too moist, add some more oats. If it's too crumbly, add some more dates or coconut oil. Press into the bottom of a lined baking pan and leave in the fridge. 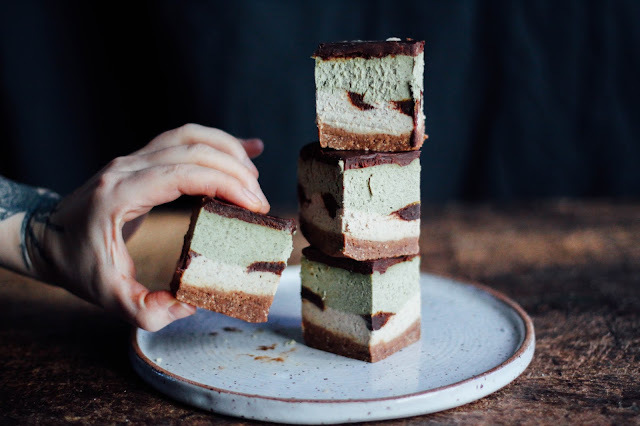 To make the middle: blend all ingredients together - except the chlorella and mint oil - until smooth, like yogurt in consistency, but slightly thicker. Adjust according to taste. Scoop half of this onto your base. Now add the chlorella and mint oil to the remaining mix in the blender and blend. Pour over your first layer. Put in the fridge so it can thicken up, then pour the fudge over top. Leave in the fridge overnight and slice the next day. NOTES: I had fudge in the fridge already before I started this recipe, so I sliced some pieces of it and put them in between my white and green layers, then melted the rest and added it to the top. Do this if you wanna! It makes it cute. And we like it cute.